This page shows the latest Denny Bros news and features for those working in and with pharma, biotech and healthcare. As part of the project, Denny Bros made a £2, 000 pound donation to Suffolk Mind following Jackson’s long-term support to the charity. 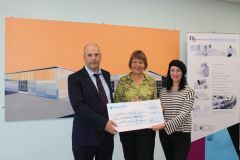 ... Sue Gray, director of the charity, said: “We are delighted to have the support of Denny Bros and Kate. Denny Bros Ltd is a leading independent specialist print company. A family run business and originators of Fix-a-Form multi-page labels, we are accredited partners to the pharmaceutical, food, ... Denny Bros Ltd.